New Delhi, Feb 12 (IANS) The Congress on Tuesday staged a walkout from the Lok Sabha after the government rejected its demand for a Joint Parliamentary Committee (JPC) probe into the Rafale fighter jet deal and accused the opposition party of "misleading" people on the issue. "The Prime Minister does not have the courage. You constitute a JPC, we will prove the misdeeds in the deal," he said. His charge was rejected by the Speaker, who said the reports were indeed tabled before the Lok Sabha -- an apparent reference to Minister of State P. Radhakrishnan tabling CAG reports, including one on the defence services. Responding to Kharge's charges, Home Minister Rajnath Singh accused the Congress of misleading people by repeatedly raking up the Rafale fighter jet deal issue. "The issue has been discussed in detail in the House and the Supreme Court has also put the matter to rest. The Congress has been raking it up every now and then. But the truth will remain," he said. "Politics is not done by misleading people. A person should have the guts to speak the truth," Singh added. 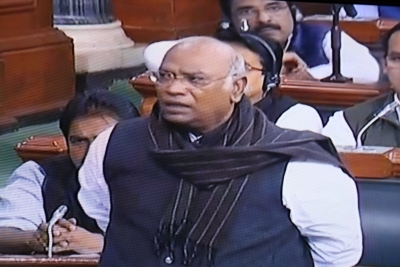 After Singh's statement, Kharge rose from his seat and left the House saying the government was not heeding his party's demands.